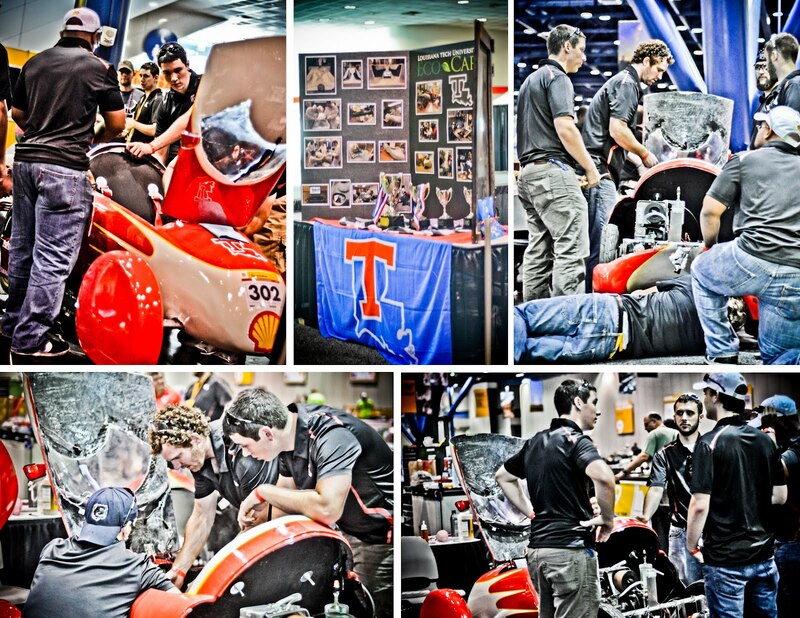 Shell's Eco-Marathon has taken place in Houston for the last three years, and Louisiana Tech University has had a strong presence in the competition since it began in the Americas. 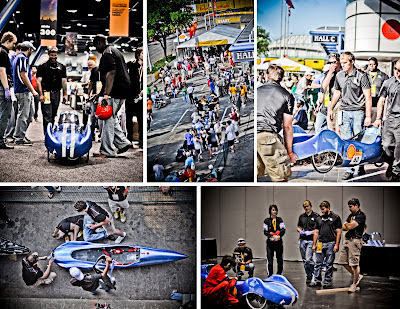 It is a fun competition where high school and college students race "prototype" and "urban" vehicles to see who can get the best gas mileage. 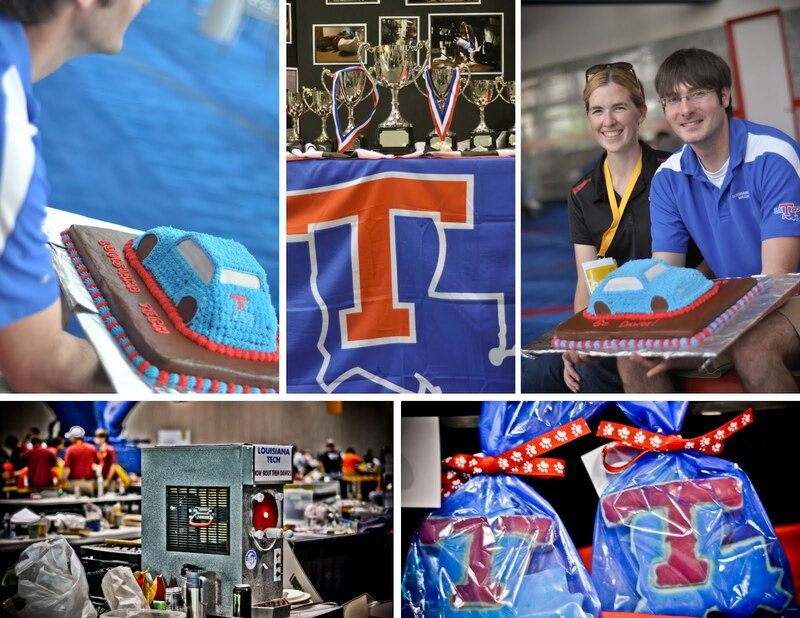 LA Tech has won multiple categories over the years, and we've even contributed by helping them win the spirit award! 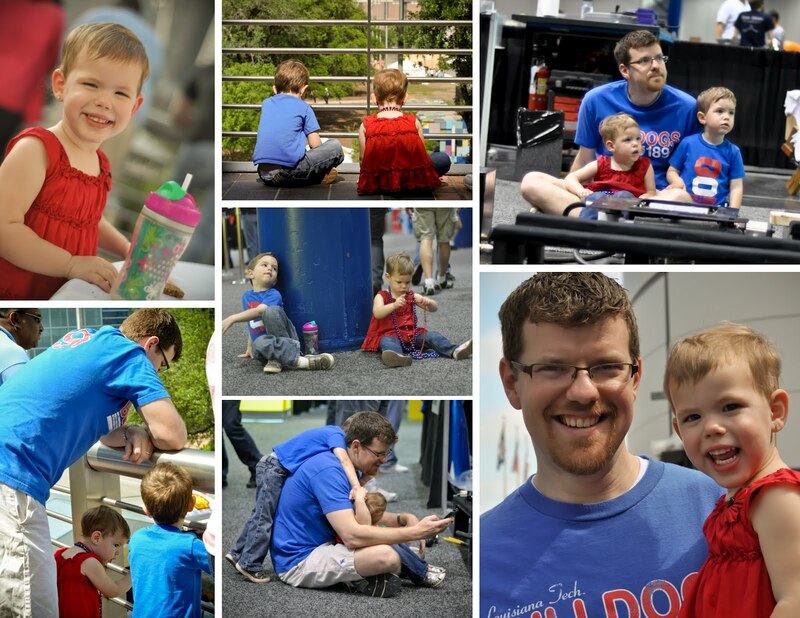 We gather on a balcony of the George R. Brown Convention Center in our Tech Blue every year to cheer them on, and this year was no exception! This year's LA Tech team was full of new faces since many of the team members last year were seniors that have graduated. Some of them returned to cheer the team on as well. They raced three vehicles this year. 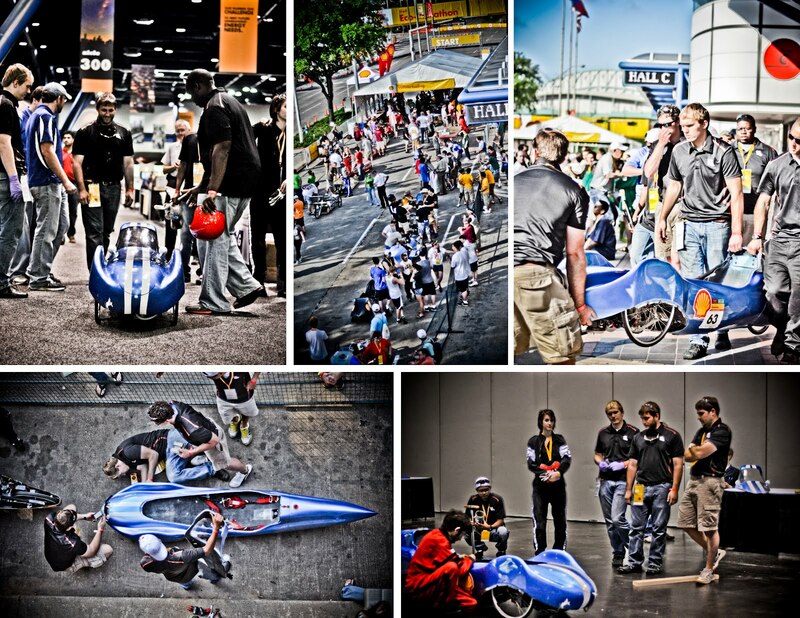 A new urban vehicle, the urban car from last year, and a new prototype vehicle. True to their reputation, each car had a sleek design. Here are the students working on getting the new urban ready for the race! This vehicle has to perform more like the cars we drive each day with stops and starts throughout the race. The prototype vehicle is strictly designed and driven to see how many MPG it can get (i.e. no stops required). This year the LA Tech Engineering and Science Foundation, which I am on the board for, held one of their meetings in conjunction with this event, and Shell gave us first-class treatment. We were given the VIP treatment during the opening ceremonies and given a special tour of the event on Friday. Ross, the kids, and I typically come to the race on Saturday, so being there for two days gave me some extra insight into the fun and challenges these teams face and the support team that keeps them going. 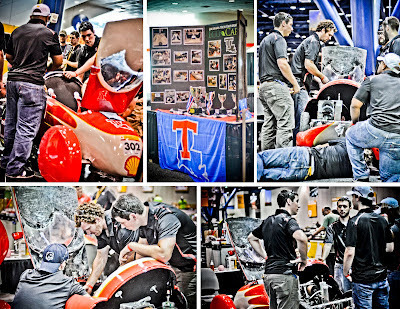 The safety inspections were rigorous and resulted in several last-minute modifications for the team, but their faculty advisers, which includes our good friend, Heath, were right there to give them tips and advice and to help them out in any way. 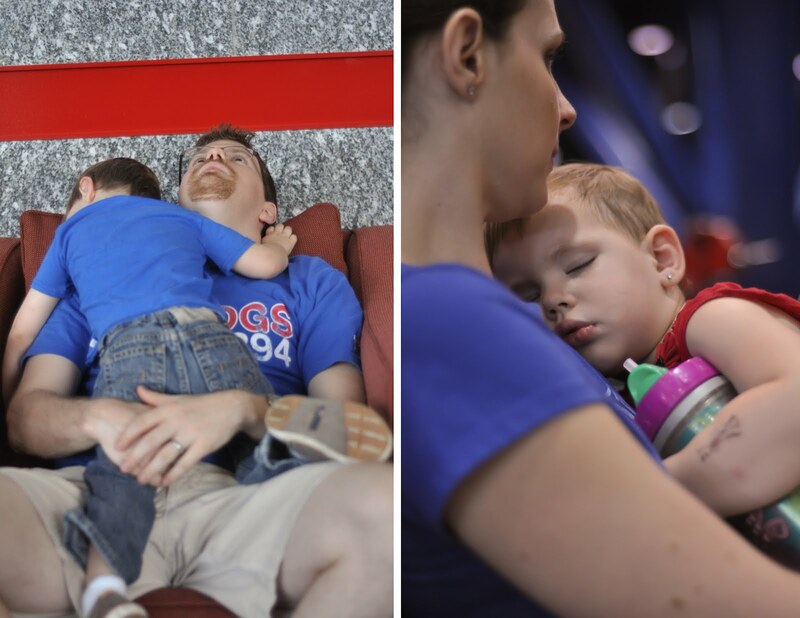 They were also well taken care of by the LA Tech family, which includes staff, alumni, friends, and family. Not only were they there to cheer them on, but they were there to run errands and supply sweet treats like this adorable cake! Here are some pics of Ross, Jackson, and Audrey enjoying the event both from the balcony and in "the pit". In the afternoon we decided to take a break from the heat. 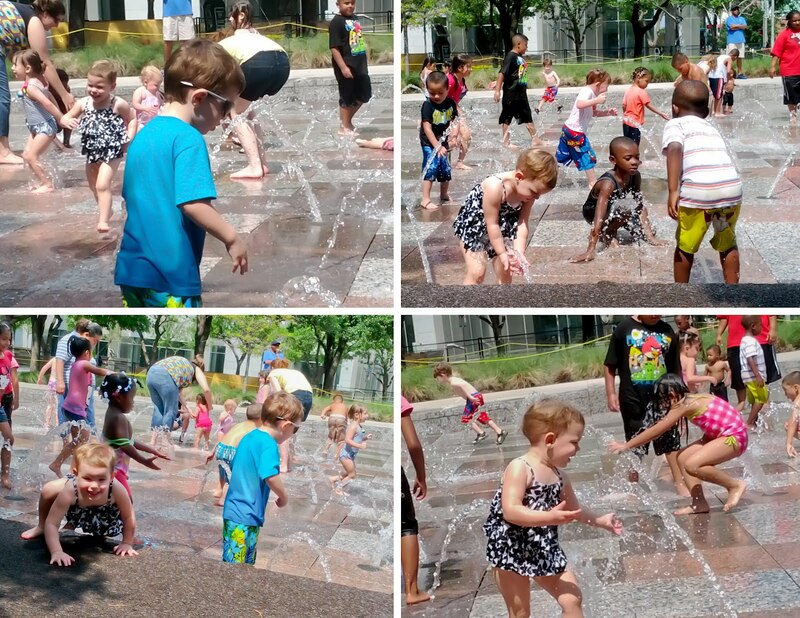 We headed across the track to Discovery Green where the kiddos played on the splash pad. 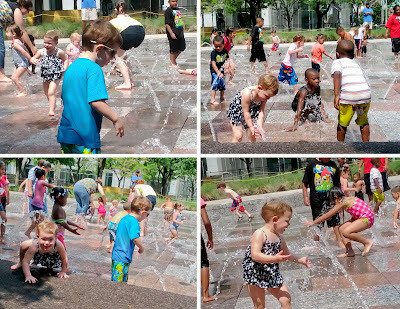 Both kids loved running around in the spray! I left my camera at the convention center, but I snapped a few shots with my phone. It was definitely a fun-filled day! Both kids were exhausted since we had them power through their normal nap times, but they were amazingly well behaved and made lots of new friends. However, both did crash for a little while at different times. This may be the first time Audrey has slept in my arms since she was a tiny baby...I cherished the moment! The race continues tomorrow, so we're wishing the team much luck as they finish it out. I know the students have learned a ton from the experience...such an amazing opportunity!